Bear lovers will delight in hugging and tumbling with this super-soft, oversize bear, designed with quality construction for lots of lovin'! 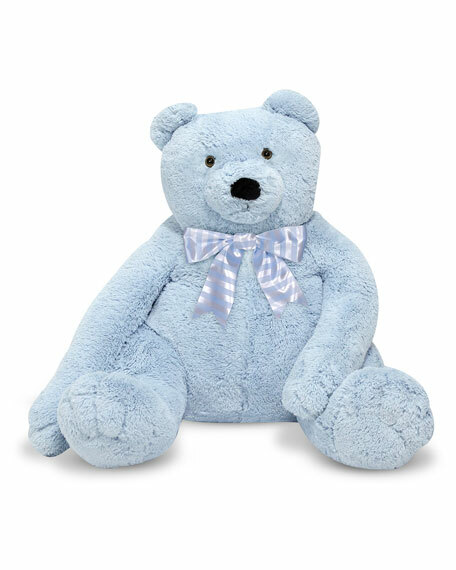 With his friendly expression and soft, baby-blue fur, this bear will become a favorite companion and confidant. Approx. 24"H x 28"W x 24"D.
Polyester plush with polyester fill. Melissa and Doug started their eponymous children's toy brand out of their basement and Doug's parent's garage with intention to innovate creative and inspirational toys. From developmental puzzles to jumbo stuffed animals Melissa & Doug have something for all ages. Every toy is handcrafted and product tested by their own children to ensure the highest quality.